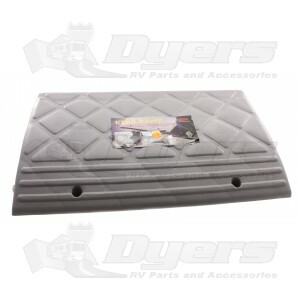 Traverse curbs or steps easily with this Curb Ramp. Traverse curbs or steps easily with this Curb Ramp. Lightweight and strong. May be bolted together for added length. Supports 20,000 pounds. 23" long x 13-1/2" deep x 5-3/4" high. Curb ramps weighs 9 pounds. Use with autos, boats, trailers and motorhomes. Ramp is rated at 20,000 pounds. Made of high impact plastic with honeycomb design for strength. You may bolt as many as necessary - typically 2 but I have had customers bolt three together for each side. We only have one size.